If you haven't heard of the GizmoTM for your neighborhood playground yet, chances are you will soon. GizmosTM are interactive playground activities that can be elevated, at ground level, freestanding or as part of a structure. They answer questions, solve puzzles, talk to users and more. The Answer Wheel allows kids to ask the GizmoTM a question and spin the wheel to reveal the answer. The Click Wheel is a fun noisemaking panel that kids can experiment with. These panels offer a choice of seven activities that can be used singly or in a group. BigToys, Inc. now offers its commercial playground equipment in steel and recycled-plastic materials, giving BigToys® one of the world's highest percentages of recycled material for commercial play equipment. 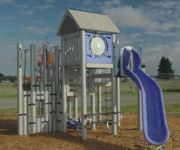 The full line of BigToys® early childhood and school-age play structures now is available made from industry-leading, 6-inch diameter, triple-coated steel posts and 100-percent-post-consumer-recycled high-density polyethylene (HDPE) plastic. These materials are offered in addition to the newest version of BigToys EPA-approved, conditioned wood products. Slip-resistant HDPE fabricates decks, enclosures, roofs and other elements of BigToys® play equipment. In 2004, BigToys® removed all polyvinyl chloride (PVC) from its products. Broyhill offers the new Highlander Sport® turf maintenance vehicle, designed to provide multifunctional tasks for turf and athletic field maintenance. The hydrostatic drive, 16-horsepower air-cooled engine and zero-turning radius provide superior maneuverability and speeds up to 12 mph. Standard features include a low-profile fiberglass body, ergonomic seat with engine switch and exclusive wraparound, rear-hinged cargo box for operator accessibility while seated. Mid- and rear-hydraulic lifts accommodate a variety of attachments. Newstripe, Inc. introduces improved features on the NewRider 2000 riding field-marking machine. Alloy steel axles, an integrated heat shield and reduced height increases the overall durability and value of the unit. Its large, 55-gallon tank can paint up to 22,000 feet of 4-inch line, which is the equivalent of four football fields. Plus, it works fast, lining up to 25,000 feet per hour. Designed with the operator in mind, the NewRider 2000 features center and side-mounted dual spray heads, seat-based operator controls, rear hitch and dual in-line filters. A hand gun comes standard for stencil and other painting needs. Precision Dynamics Corporation, a global leader in automatic wristband identification solutions, provided the Jacksonville Suns with radio frequency identification solutions for age verification and cashless payment during the Times-Union SuperFest, an official Super Bowl XXXIX event. To prevent and control underage drinking during SuperFest, the Suns implemented PDC's AgeBandTM Electronic Age/ID Verification System along with Smart AgeBand Wristbands. AgeBandTM uses software to verify the authenticity of state-issued drivers licenses or ID credentials. The system scans the credential and prints the patron's age, "Age ID Verified 21" and other pertinent information on a Smart AgeBand Wristband that contains an RFID chip. The new Watercannon 1.5 by Living Waters Aeration is the more affordable of the company's two portable, self-priming aerator units. It pumps 110 gallons per minute and is rated 115/120 volts, 20 amps. The aeration systems safely replenish necessary fresh oxygen supplies into your pool through re-circulation. This safe, healthy and natural process is not only an enjoyable and refreshing way to control and reduce hot, steamy summer water temperatures by 15 to 20 degrees, but it also provides a fun water feature for kids to play under. 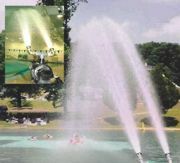 The US Olympic Committee even purchased a Watercannon for the 2004 swimming competition. Whitewater West offers the custom-themed AquaPlay play structures, such as the new AquaPlay RainFortress at Casino Pier at Water Works in New Jersey. The interactive structure is loaded with elements that play up the deep-sea fishing theme, including a themed tipping bucket/boat. This attraction and theming are an effective fit for the surrounding area and are sure to be a popular family destination. Gold Medal® Products, a leading one-stop concession source, offers its 61st Edition 2005 Funfood catalog. A guide to profit-building concepts, this full-color, 112-page catalog showcases one of the widest ranges of equipment and supplies in the concession industry. You'll find everything necessary for producing money-makers such as popcorn, cotton candy, Sno-Kones®, shave ice, nachos, pizza, hot dots, frozen drinks and many others. A wide range of new and enhanced items are featured as well, such as poppers, cotton candy machines, hot dog grills and steamers, Sno-Kone® equipment, and new Whiz Bang Games.